Britannia holding a laurel wreath beneath which was a rectangular tablet where the deceased individual’s name was cast into the plaque. No rank was included as it was intended to show equality in their sacrifice. The required inscription “He died for freedom and honour” was inscribed along the outer edge of the disk. In front of Britannia stands a lion and, two dolphins representing Britain’s sea power. A smaller lion is depicted biting into an eagle, the emblem of Imperial Germany. 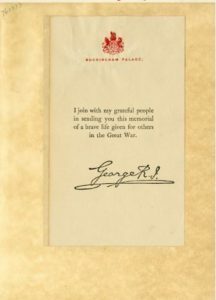 With the conclusion of the war, over 1.3 million plaques were sent to grieving families throughout the British Empire. Plaques were sent to the next of kin for all soldiers, sailors, airmen and women sailors, airmen and women serving who died as a direct consequence of their service. 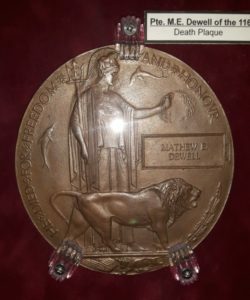 Plaques were also sent to the next of kin of those who died between August 4, 1914 and April 30, 1919 as a result of sickness, suicide or accidents, or as a result of wounds sustained during their time of service. 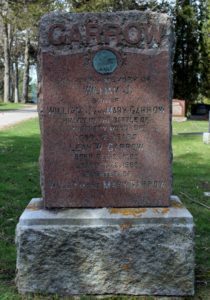 The family of Oshawa, Ontario resident William Garrow Jr. decided a permanent home for his memorial plaque was most fitting and they chose to have it mounted into a gravestone. Garrow was born on May 15, 1894 to William and Mary Garrow., the youngest of four children and the only surviving son. ← I am Member of the Week!